Our favourite bowler hatted comic pairing of yesteryear,go from almost penniless in America to a terribly daft time at Oxford University. With an almost eerie early role for another actor. 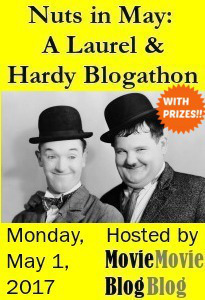 I read about the Nuts in May blogathon run by Movie, Movie, Blog, Blog celebrating the work of Stan Laurel and Oliver Hardy in the movies. After reading more, I decided to join with this film, A Chump at Oxford (1940). This was as I was interested in how Oxford would be portrayed in this film made in the 1940s. Oxford being an English town, I lived in for a year about 20 years ago (eek). And the location of a guilty pleasure Brat Pack film Oxford Blues (1984). On learning more on the film, Wikipedia states that this film is a parody of A Yank at Oxford (1938). This a film I thought I’d seen before and starred Bing Crosby, my gran’s favourite crooner. Crosby stars – and acts – in my fave musical, High Society (1956) and those Road To movies – with Bob Hope – that Seth MacFarlane parodies so well. Dallas‘fans will also know Crosby as the father of Mary Crosby who as Kristen Shepard shot JR Ewing in 1980’s most famous whodunnit and cliffhanger. But on reading more on A Yank at Oxford it does in fact star Robert Taylor as the American, with Vivien Leigh also in this cast. And the film I was thinking of, with another American (Crosby) finding himself in in fact Ye Olde England. As the film was in fact A Connecticut Yankee in King Arthur’s Court (1949). By a bizarre twist of fate, I also learned that A Yank at Oxford was remade in the 1980s with the Brat Pack starring Rob Lowe and Ally Sheedy in the form of the previously mentioned Oxford Blues. Which this to be reviewed parody film did remind me of on numerous occasions particularly with its scenes of Oxford, terribly Posh English accented stereotypes and an early role for now well-known name. But more of this later. This review is of the final version of A Chump at Oxford as there have been several scenes and about 20 minutes of film added over the years. So on with the review of this classic movie. The film starts with this famous bromance’s signature tune that you’ll easily recognise. It was a lovely start to watching one of their movies. In a side note the tune is named The Cuckoo Song, Ku-Ku, or The Dance of the Cuckoos. The opening scene has our moch loved Bowler hatted duo, Laurel and Hardy sitting in the back of a swanky car. Hardy – the one with the moustache – smoking a cigar with Laurel, his long time film partner. All is not how it seems as the pair have hitched a lift and on arrival in town, a second possible lift pranks them. With some great visual slapstick scenes along the way. The almost penniless pair arrive at an employment office looking for work with the only work available being for a butler and a maid. Cue Laurel, in drag as Agnes in what can only be described as a Mary Poppins outfit and a curly wig last seen on The Greatest American Hero (1981-83). Seeing this All American travesty recently via t’Internet after confessing I liked the theme tune. Definitely a case of great theme tune, shame about the show. Anyway back to the film. This job is not a success for the hapless pair and it all goes downhill rapidly after Laurel Agnes’ knicker elastic breaks and he she literally undresses for salad. Hardy calls all for dinner using a xylophone, and in a well-coordinated scene where he reorganises the numerous dinner guests by barking orders at them. A task which Captain Von Trapp – from The Sound of Music (1965) – would have completed much more quickly. So after many fun chaotically fun scenes and double meanings taken the wrong way, the bowler hatted pair are chased out of their job to the sound of gunshot. So the pair are now road sweepers who on their lunch break signalled by an alarm clock (! ), assist a man who collapses in front of them. Coincidentally, this man had just robbed a bank, tying up the manager. The cops apprehend him immediately and the manager as a thank you honours the boys’ wish to improve their education. So its off to Oxford University, England we go… by boat, by steam train and horse and carriage. Darlin’ Husband told me that there was a petrol shortage and it was rationed in Britain at this time which explains the horse and carriage. And it certainly adds to the humour of the stereotyped England – which reminded me of another two American characters in a stereotyped England with actors, in 3 Men and a Little Lady (1990) which featured t Tom Selleck and Steve Guttenberg in a Mini. The opening scenes in Oxford are a delight, with our pair dressed for their new student role with cape and mortar. A group of fellow male students, with a dark side, decide to prank the newcomers. They tell them they are dressed for Eton not Oxford. This “induction” is the norm for new students in the movies. An example being Class (1983), another Brat Pack film where Rob Lowe (again) convinces new student Jonathan (Andrew McCarthy) to don some ladies undies, convincing him this is the done thing at their University. And Starter for 10 (2006). Laurel and Hardy are then sent to the Dean’s office via a maze by these villains. This leads us to some fantastic storytelling, as daylight turns to night and the pair are haunted by a “ghost”, one of the villainous students in a sheet and top hat (of course). And I’m already imagining a parody of these scenes intercut with the maze scenes involving Jack Torrance (Jack Nicholson) from The Shining (1980). In a fantastically choreographed scene with fantastic timing, Laurel is slowly convinced he has an extra hand as the “ghost” and his buddies play havoc with the pair. This band of scoundrels reminded me so much of Julian Sands (not Dr Christian Jessen) and Cary Elwes and their band of merry men fellow thesp buddies – and correct me if I’m wrong but sure I saw Cumberbatch in this clique – in Oxford Blues. And Laurel and Hardy eventually find their quarters for the night after instruction from these reprobates, and settle down for the evening. Not realising they have been fooled them again. The Dean enters his apartment. The reminder of this film plot can be found in the usual way, but be prepared for an excellent twist in the tale showing Laurel with a plummy English accent – and monocle – and more on that famous name in more eerie than comic scenes. I am adding this to my now growing list of fantastic films discovered through blogathons. I loved the visual slapstick scenes and the amusing script. The scenes between Laurel and Hardy showed a great rapport and friendship, each allowing the other one their share in the limelight in their individual scenes and yet sharing it in their joint scenes. I’m not a big fan of slapstick tbh, but here it enhanced rather than distracted you from the story line. I loved some of the more fun obscure additions to the story line with the alarm clock reminding me of home where a similar set up alarm signals a dude it’s his turn on the games console. Like Laurel and Hardy set their lunch alarm to the second, we have a similarly timed one set up by the kids not the adults in the house. So I’m surprised – and relieved – they hadn’t made a they remake of this Laurel and Hardy movie into a by the numbers 1990s bromance movie with Ben Affleck and Matt Damon. It would have been a total travesty to do this to this fun, original parody. And therefore also should be thankful this film was overlooked in favour of the original film for Oxford Blues. Finally, it was interesting to see an early appearance of an English actor that may horror-ify you. But keep your eyes peeled, as the length of time he appears is much less than his Top Secret (1984) appearance. He can be spotted in some of those more foreboding scenes, as the students chant to bring their form of justice to Laurel and Hardy, after their villainery has been discovered. In scenes this actor would later encounter in his many Dracula themed scripts. As I don’t want to hammer home about his particular role in this wonderful endearing Laurel and Hardy movie, it’s Peter Cushing. And now knowing this, you’ll be looking out for this all to brief appearance of this unlikely fish out of water. Which is how I felt as a Scot in Oxford watching a Trainspotting (1996) at the cinema. With subtitles. Bonus Trailer: Yes, that guilty pleasure Brat Pack movie trailer for Oxford Blues. I entered A Chump at Oxford (1940) in Movie, Movie, Blog, Blog‘s the Nuts in May blogathon. I’ve not reviewed any other films with Laurel and Hardy. However, Peter Cushing stars in my reviews of Top Secret (1984) and Dracula AD 1972 (1972). Other fish out of water reviews include the aforementioned Class (1983)and Starter for 10. (2006). Great post! Visiting Oxford is on my bucket list. I can only take L&H in small doses but will have to add this to the need to watch pile. Thanks for sharing on The Classic Movie Marathon Link Party. I appreciate it. My, you certainly enjoyed A Chump at Oxford, along with all the memories the funny team conjured up. You reminded me of all the parts of the movie that I enjoy and must revisit soon. Thanks, I did love this film but seeing Laurel in drag as Agnes in that Mary Poppins costume was by far the best scene. This is a fantastic post, and I love your Oxford film throughline, I will definitely check out this film, it sounds like a hoot! PS No shame in digging The Greatest American Hero theme. 😉 I love to sing that song. Nice summary of a funny (and oddly touching) Laurel & Hardy outing. Thanks for contributing to the blogathon!